Same whopping great broadsheet newspaper format (23" x 16.5"), same ink-comes-off-on-your-fingers retro zine joy… but now with 32 PAGES of art, creativity, protest and resistance, including pull-out 'Unmanifesto' poster section featuring exclusive art by Wolfgang Tillmans, Sara Rahbar, Boychild, Scott King, Torbjørn Rødland, Helena Foster + more, curated by Francesca Gavin. Yes! Issue 22 also includes a studio visit in Brooklyn with Hank Willis Thomas, who creates powerful work at the intersection of race, art and politics. Going for a drink with Viz cartoonist Barney Farmer, author of Drunken Bakers, The Male Online and other painfully funny takes on modern British society. A conversation with outspoken Edinburgh rap trio Young Fathers. Philosophy with Patricia MacCormack and Warren Ellis. And a chat with 95-year-old WWII veteran and activist Harry Leslie Smith about his crowdfunded tour of the world’s refugee hotspots. PLUS: Artist Taxi Driver, Downtown for Democracy, Molly Crabapple and Marwan Hirsham, Amplifier Foundation, protest in South Korea, the Guerrilla Girls, the Rev. Billy of the Church of Stop Shopping, Sea-Watch, Steve Lazarides, and Yinka Shonibare. And some other stuff like The Brexit TV Times. NO REALLY, I WANT TO BUY one NOW! 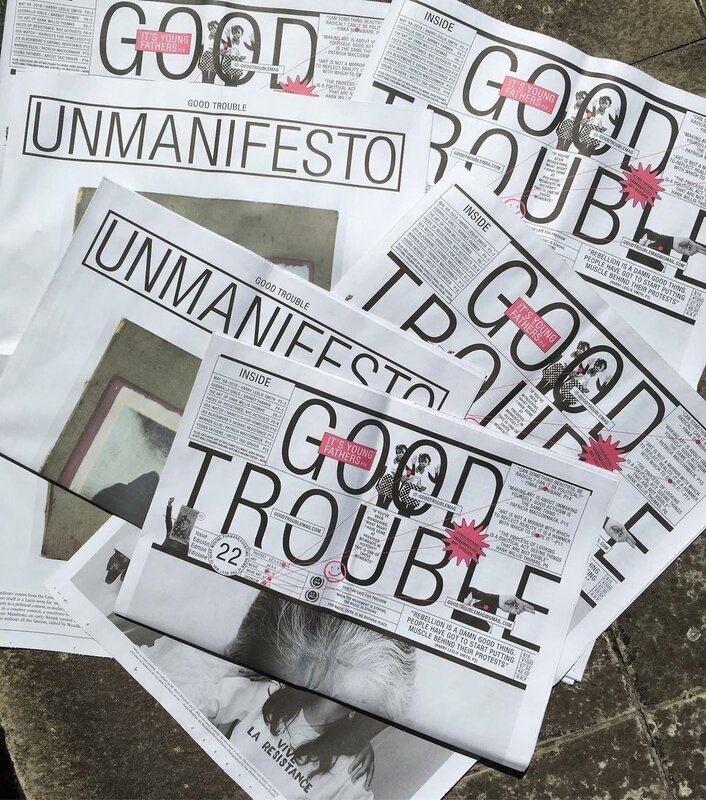 Good Trouble Issue 22 is available from our online SHOP and discerning stockists such as MagCulture, Printed Matter, MoMA PS1 Artbook, Athenaeum, Kioskafe and others – want to stock it? Email us. 20% of proceeds will go to RAICES, a nonprofit agency that promotes justice by providing free and low-cost legal services to underserved immigrant children, families, and refugees in Texas. Since the Trump administration’s family separation policy at the US border, RAICES has found itself at the frontline of the fight to protect and reunite families and children. Their work now extends outside Texas, and they recently launched the National Families Together Hotline to aid in reuniting families that have been separated upon entry into the US.